This weekend, Hayesville, North Carolina will offer their annual Festival on the Square.The festival begins Friday evening, July 8th, with a street dance. Music and many vendors will grace the square on Saturday and Sunday, July 9th and 10th. Included in this event will be our North Carolina Writers' Network-West booth, which will be on the North side of the square. Several local poets and writers, members of NCWN-West, will be attending the booth, and will read periodically from their published works. Included in this line-up, are Tom Davis, Joan Ellen Gage, Mary Rickertson, Rosemary Royston, Marcia Barnes, Glenda C. Beall, Joan M. Howard, Bob Grove, and Lucy Cole Gratton. During the day, the booth will have books to give away. Please make an effort to come by and support the wonderful members, who are taking time to showcase our writers' network. No matter the level of expertise, the Blue Ridge Writers' Conference provides a venue for professional and aspiring poets and writers. This year's Writers' Conference will offer a four-hour Workshop Intensive on Friday, April 8th. The Workshop Intensive will focus on "Show, Don't Tell: Yes, Yes, But What Does That MEAN?? ", presented by Jennifer Jabaley & Kristin Tubb. Join us on Friday evening beginning at 5pm and meet fellow attendees and conference speakers. Enjoy light fare as you network. Stay after the meet and greet and enjoy our double opening reception to The Art Center's latest exhibits, The Photography of Arni Katz and the Valley River Artist Guild Exhibit. Saturday, April 9th begins with light breakfast fare and our keynote speech. The 2016 keynote speaker will be Stephanie Fretwill-Hill. Stephanie is an agent at Red Fox Literary and her keynote, entitled "An Insider's Look At The Publishing Process", will follow a manuscript as it goes from submission to the acquisitions process, through editorial and production, and finally on to sales and marketing. The day continues with concurrent workshops on everything from freelancing for digital & print writing, writing your children's fiction or non-fiction, revising your poetry to marketing a manuscript. Our 2016 speakers include Robert Brewer, Tara Lynne Groth, Steven Harvey, Jennifer Jabaley, Deborah Malone, Lola Schaefer, and Kristin Tubb. Conference attendees appreciate the chance to network with other writers and speakers during the day and the opportunity to submit their work for critique by one of the conference speakers. Book sales will also be made available throughout the conference. We look forward to you joining us this year for our 19th Annual Blue Ridge Writers' Conference! You are invited to enter the Southern Appalachian Artist Guild's (SAAG) 2016 National Juried Show. Cash prizes totaling $5,000, including $1,500 for Best of Show, will be awarded. Show dates are October 15 - November 12, 2016 at The Art Center. Click on the link below for the official prospectus. You are invited to enter the 2016 BRMAA National Juried Photography Show. The 2016 BRMAA National Juried Photogrpahy Show is open to all photographers, amateur to professional, and all original photographic media, including film and digital images. Cash prizes totaling $3,000, including $750for Best of Show, will be awarded. Show dates are September 3 - October 9, 2016 at The Art Center. 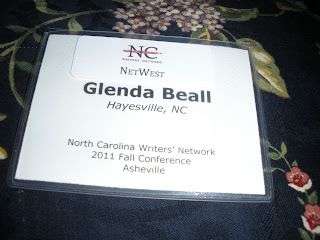 The North Carolina Writers' Network 2014 Fall Conference will be held November 21-23 at the Sheraton Charlotte Hotel, in Uptown Charlotte. If you've already registered: thank you! If not, can you really miss an opportunity like this, happening in your own backyard? 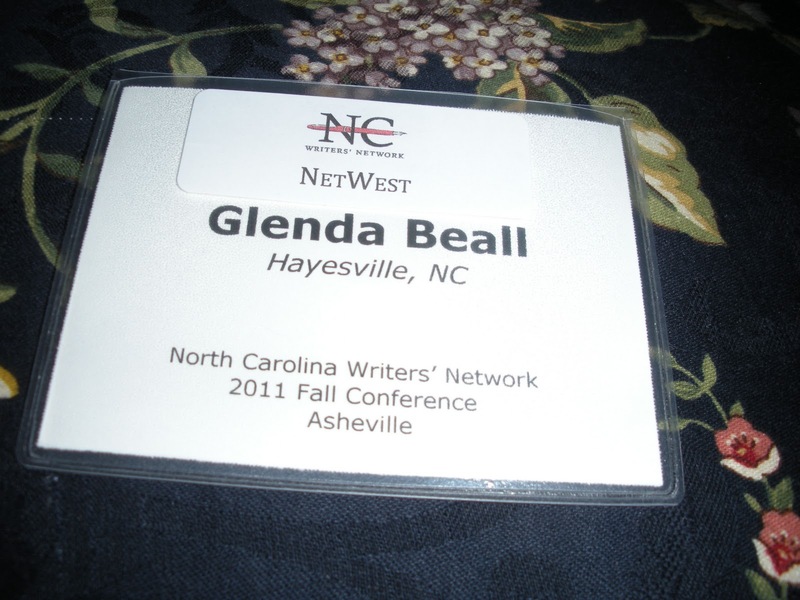 The North Carolina Writers' Network 2014 Fall Conference offers something for almost every writer, at any level of skill or experience. Your best route to getting the most out of the weekend depends on where you are right now as a writer, where you want to go as a writer, and how you want to get from here to there. Are you a NOVICE writer? Good workshop options for newbies include Chantel Acevedo’s “All Shapes and Sizes: A Workshop on Novel Structure”; “Poetry 101” with Anthony S. Abbott; and “First Impressions in the First Few Pages” with Sarah Creech. Are you an EMERGING writer? You may want to mix some of the craft workshops—maybe “Poetry and Time” with Julie Funderburk; “Making Their Stories Your Own” with Rebecca McClanahan; or Zelda Lockhart’s “The Mirror Exercise: Producing a Whole Short Work in Less Than an Hour”—with some of the appropriate business-of-writing workshops like Sunday’s panel discussion on “The Many Paths to Publication” with Kim Boykin, John Hartness, and Karon Luddy. Are you an EXPERIENCED writer? You may be ready to concentrate on the “business of writing” workshops: “The Art of the Pitch” with Betsy Thorpe and Carin Siegfried; “Crafting Your Message: Beginning an Interactive Publicity Campaign” with Priscilla Goudreau-Santos; “The Many Paths to Publication” panel discussion; maybe even “Creating a Poetry Community” with Scott Owens and Jonathan K. Rice. And if you're an AUTHOR, well, why not register for the conference just to brag? And of course to enjoy the keynote address by Allan Gurganus; Saturday's luncheon featuring North Carolina's seventh poet laureate, Joseph Bathanti; and Saturday night's annual banquet featuring the inimitable Wilton Barnhardt. The North Carolina Writers' Network Fall Conference changes locations each year, in order to better serve the writers of this state. We won't be back in Charlotte until 2018, at the earliest. We don't want to wait that long to see you. Thursday, October 16th 7:00 p.m.
We arrived early and grabbed a great table near the entrance to the Exhibitor Area. Directly in front of us were JC Walkup and Penny Morse with a table for Fresh, their beautiful literary magazine. JC is distributing Echoes in the Waynesville, Asheville and Canton areas. She will be glad to sell a copy or two as she says storing them is a nuisance. Joan Howard, Netwest poet from Hiawassee, GA and writer, quilter and knitter, Barb Haynes who lives in Murphy and is a Netwest member also, rode with me to Asheville. Great travel companions and good caretakers. Little did they know I’d become ill on Saturday afternoon. I missed all the fun on Saturday evening, the open mike readings and the happy hour gathering as I slept in my room. I can never thank Joan enough for taking the early hours she logged in at the Netwest table. Bright and early Saturday and Sunday, she welcomed writers, handed out brochures and sold books. Our Netwest members came by to pick up their Netwest stickers to attach to their name tags. Betty Reed manned the table on Friday evening while I had dinner. Barb also filled in when needed. Others who represented Netwest at the table were Mary Ricketson, Susan Anderson, Pamela Warr, Linda Smith, and Rosemary Royston, Program Coordinator. Many thanks to them from me and Netwest members for being there to help when needed. I feel sure all these writers enjoyed the conference because each time I saw them they had big smiles on their faces. She saw the Asheville Citizen-Times book columnist across the hall. I told her to go for it. Novelists and non-fiction writers came to find agents and publishers. Poets hoped to find the best place to submit a poetry book. And everyone wanted to chat about writing with other writers. But I imagine most were looking to learn something from the accomplished faculty that would stay with them and be the spark to push their writing up a notch. Because I was tied pretty closely to the Netwest Table when I was at the conference, I was delighted so many folks I know dropped by. One of our first visitors was Scott Owens, poet, editor, teacher, and very nice guy. I especially enjoyed meeting Netwest members who have recently joined or even some who have been members for a long time, but I’ve not encountered before. Betty Reed and Pamela Warr are two of those members I had not met, but learned more about them and their writing. 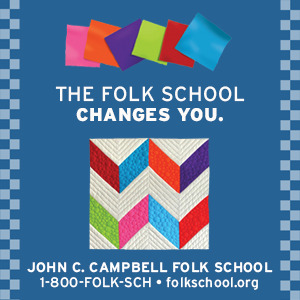 Pamela Warr designed our most recent brochure and the new Netwest logo. Bill Ramsey was promoting the phenomenal literary event, the Blue Ridge Bookfest at Blue Ridge Community College in Henderson County NC. Just a short time ago the first bookfest was a toddler, and now it is running and jumping. Bill says the college has come on board with the volunteers and can guarantee continuity of this well-attended showcase for authors. Netwest was a supporter of the first bookfest, and we have been there to help in any way we can each year. NCWN is a sponsor, too. Scott Douglas’s Main Street Rag exhibit seemed to always have writers gathered there. I appreciated Scott coming over to chat. He has been quite successful with his small press and publishes some of the best authors in North Carolina. He told me to check out his site to see the books by other presses that he sells. Wouldn’t it be great if Echoes were listed there? Kevin Watson from Press 53 and Keith Flynn with the Asheville Poetry Review seemed to be popular in the exhibitor’s center. People were talking about Keith’s interesting poetry presentation. His band also played Saturday night for the banquet. I didn’t hear them from my room on the third floor, but I’m sure they were entertaining. 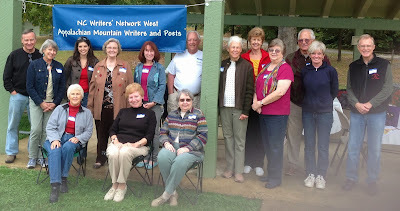 Our own Netwest founder, Nancy Simpson, held a poetry workshop. I heard many compliments on that session. I'm sure those poets came out of that room wanting Nancy's book, Living Above the Frost Line, which has received awards and nominations for awards this past year. The keynote speaker, Silas House, blew us all away with his talk. But I’ll write more about that in another post. Ed Southern held a townhall meeting and updated us on the Network. As Ed said, NCWN is not the staff. NCWN is the members. To truly feel a part of this large writers’ network in our state, I think you should attend at least one Fall Conference. I always leave feeling motivated, energized and enthusiastic about my own writing. I look forward to the next one -- Fall 2013. Normally I wouldn't have gone to this conference since it was such a long distance, over six hour drive, but I felt, as the Netwest Program Coordinator I should attend. I'm very glad I did. Much was accomplished for our group, I think, and I'm confident the Network is doing well and on the right track. Friday afternoon, I met Mary Jo Dyre from Murphy and hooked her up with another western NC native, Pat Davis who lives in Pennsylvania now. Both these ladies were there to pitch their novels. And this was the place to do it. So many publishers, agents and programs for meeting the people authors need to know. I met Debbie McGill, Literary Director of the NC Arts Council as soon as I entered the registration area. Debbie is a long time friend of Netwest and attended our Lights in the Mountains Conference when it was held in Hayesville. She was interested to hear all that is going on with our group. I had a few of our online newsletters, The Netwest News, with me and I gave her one. Nicki Leone, president of NCWN arrived and I made arrangements to meet with her and Al Manning on Saturday to go over our revised guidelines and mission statement. Sara Claytor, a member of the NC Poetry Society stood near the NCPS table. She was excited to have her first poetry book published. I meant to buy one later, but never got back to pick it up. We talked about the possibility of "swapping writers" from her area in Raleigh to our area in western NC for readings, workshops, and other events. She said the poetry society talked about our "Coffee with the Poets" at one of their meetings and they would like to look into doing the same thing in their area. Ed Cockrell, publisher of the NCPC Correspondent, included an article on CWP this year. I had invited Netwest folks attending the conference to join Barry and me Friday night for dinner. I was delighted to have Ken Kinnett and Lana Hendershott of Henderson County, Mary Jo, and Nancy Cash, author of Ritual River, join us along with our new friend Pat Davis. Although Nancy lives in Asheville, she is a native of Murphy, NC. Mary Jo and Pat seemed delighted to have Nancy tell them of her experiences in the publishing world. After dinner, Jill McCorkle gave the keynote speech and entertained us all with her humor and insight into making your charactors believeable, even if you have to use some bad language to do it. 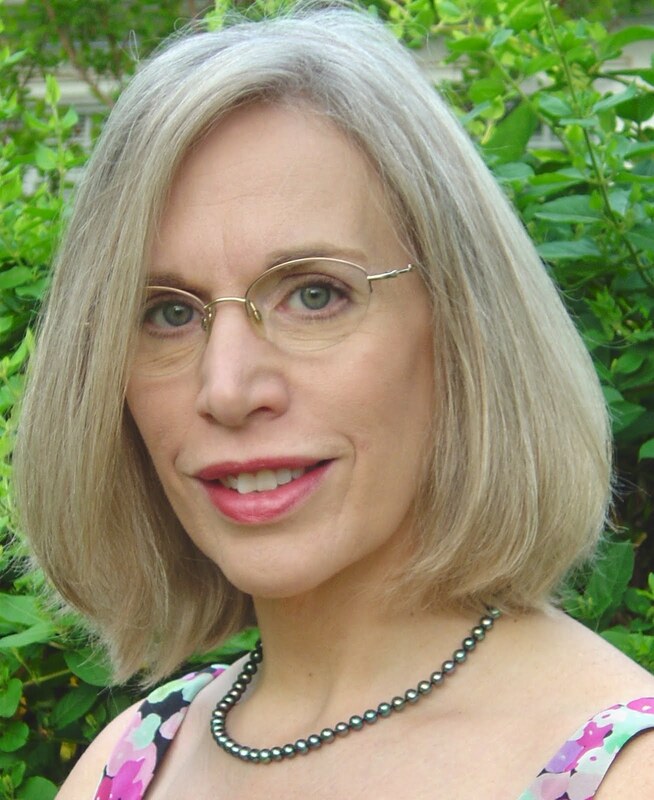 Jill is one of our outstanding southern writers who hails from Lumberton, NC. As I left the jam-packed hall after Jill's speech, I was tired but exhilerated from so much creative energy in that room.